It's very likely that your pooch may develop sensitive skin due to a variety of reasons. Causes of sensitive skin are abundant, which results in skin irritation and excessive itching in the dog. Dealing with this problem can be frustrating, but solutions do exist. Other than topical and oral treatments, there's always a way to feed dogs with sensitive skin to alleviate the symptoms. This has been tested and demonstrated in several studies with dogs and cats with skin problems. What's Sensitive Skin in Dogs? Sensitive skin disorder is a broad term for one of the skin conditions in dogs that affects a high population of canines, and it's one of the most common health problems pet owners encounter. If your dog is constantly scratching or his coat is showing signs of hair loss, redness or inflamed skin, he probably has a sensitive skin. Bald patches and excessive shedding can also occur in some cases. All of these symptoms are caused by some type of skin irritation. Mites, dust, pollen and even food allergies can all be behind your dog’s skin disorder, but your Fido can also simply have sensitive skin due to his genes or because of environmental factors. The first thing to do is to consult with your vet to determine what is the cause of your dog’s skin irritation before you make any changes to his diet or use any treatments. Depending on the causes and symptoms, you may need to use skin infection treatments, medications, remedies like natural waxes/balms or other solutions. This article will not discuss general dog skin disorders or the condition of sensitive skin in dogs itself. Instead, we're going to focus on the diet for dogs with sensitive skin and how you can combine feeding with other treatments for the best result. Nutrition will directly impact your dog's health; it can be the cause of sensitive skin condition but it can also help with the problem. Studies show that adjusting your dog's diet with specific guidelines in mind can positively affect his skin condition (Watson, 1998; The Journal of Nutrition). Even if your pet's skin irritation is not due to food allergies, a diet change adjusted with a focus on a healthy and shiny coat will be of great help. Transitional period is very important. When you're ready to change your dog’s diet, make this transition as smooth as possible. Do it slowly, over the course of one week to ten days. Every day you should add, gradually, more of the new ingredients and decrease the amount of old food (watch this video for more tips). 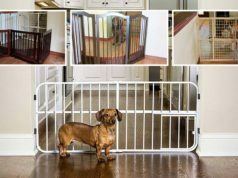 This will help your dog accept the transition without any digestive issues. The key with the new diet is two-fold: (a) feed your dog natural, minimally processed ingredients, and (b) pick the formula or recipe focused specifically on skin disorders. There are a lot of bad dog food brands out there. These diets full of fillers, chemical preservatives, artificial colors and flavorings and low quality by-products can aggravate your dog’s sensitivities and even lead to allergies and skin disorders. High quality sensitive skin dog food brands specifically formulated for skin sensitivities in dogs will work better, or you can also make homemade dog food for sensitive skin yourself. Some foods are better for skin than others. There are certain nutrients you should prioritize in your dog’s diet when dealing with a sensitive skin problem. Protein is likely to make up a large part of any dog food brand or recipe; however, the key here is high quality protein sources because not every protein is equal. According to studies, specific meats are also likely to cause skin problems in dogs, most commonly beef, lamb and pork (Martin et al. 2004; Vet Dermatol). Best protein source for dogs with sensitive skin should be highly digestible and statistically less likely to cause skin irritation. Some of the high-quality protein sources include poultry, fish, eggs, and even horse meat. Cow's milk should be avoided as it's also one of the primary suspects when it comes to skin problems in dogs. Essential fatty acids (omega-3's EPA and DHA in particular) are what almost every dog diet out there is lacking in. Research shows how including a larger amount of omega-3s in your dog's diet can help with skin disorders (Bauer et al. 2007; J Am Vet Med Assoc). EFAs also improve skin elasticity and help your dog have a shinier coat. Best natural sources of omega-3 are fish and fish oil, which is something you can add either to your homemade dog food meals, or even to commercial kibble as a fish oil supplement. Vitamins and minerals are commonly found in fruits and vegetables, or can be given in the concentrated form (i.e. multivitamin pills for dogs). 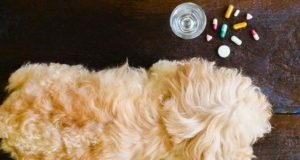 However, the absorption levels from pills are extremely poor, so it's best to include natural foods in your dog's diet, or pick commercial brands that contain the same nutrients. Good natural foods are apples, carrots, potatoes, pumpkin and beet in your dog’s diet. Organs meats like liver or heart are excellent sources of minerals and vitamins for the dog as well. Vitamin A – it's is crucial to the health of fast-dividing skin cells, as well as hair follicles. Vitamin A can be found in liver, carrots, spinach, eggs, sweet potatoes, and fish oils. Biotin – this is a B-complex vitamin that promotes healthy tissue growth. Young, growing puppies are most likely to suffer from a biotin deficiency, which can cause crusty skin and brittle hair. Eggs, milk and meat are naturally high in biotin. Vitamin E – it's a natural antioxidant and he can help with the protection of your canine’s skin cells against free radicals. Vitamin E is commonly found in bran, seeds, leafy green vegetables and liver. Copper – a mineral that can help in preventing loss of hair, and keeping your dog’s coats shiny and soft. It can also help you maintain his hair color. Copper is found in seafood, whole grains and seeds. Zinc – another important mineral that is always a part of high-quality dog diets because it can prevent inflamed, itchy skin and even fungal and bacterial skin infections. Zinc can be found in beef, poultry, yogurt, and many vegetables. Structuring and adjusting your dog’s diet for certain conditions like sensitive skin can be hard if you stick to only commercial dog food brands. Most of them almost always include preservatives, additives, highly processed ingredients or things that you'd rather avoid when dealing with this health problem. There are of course specialized prescription dog foods for sensitive skin, but they are often very costly. The next best thing to buying prescription sensitive skin dog food brand is to keep switching between somewhat appropriate commercial dog food brands and a homemade dog food diet, or completely switch to cooking for your dog for a period of time. If you do start utilizing homemade dog food recipes for sensitive skin, here's what you must know. Fish is the most recommended protein source for dogs with sensitive skin. Other than that, and for extra essential fatty acids, include various seeds in your dog’s diet. The best choice for his skin are chia seeds, since they are rich in vitamin B, copper and zinc, which are all great for your dog’s skin. They are also filled with other antioxidants and they are gluten-free. They contain calcium, iron, phosphorous and magnesium, so they are really nutritive and great for your dog’s overall health. They are high in omega-3 fatty acids and they nourish your dog’s skin. Just sprinkle your dog’s meal with some chia seeds every day. One teaspoon per meal is more than enough. Eggs are nutritionally rich and they can be a regular part of your dog’s diet. They are great for his skin and coat because of lutein. They also have zinc and biotin and vitamin A, as well as both essential fatty acids, which is all good for your dog’s skin. Technically, almonds can be a good skin-friendly occasional treat. They are rich in vitamin E, vitamin B, copper and zinc, with traces of omega-3 fatty acids. However, dogs are not very good at digesting almonds, therefore you should try them only in very small amounts and as a rare treat. If your dog tolerates them well, the amount can be increased. Add a little bit of coconut oil to your dog’s meal. You can also use coconut powder to make treats for your pooch. Coconut oil is good for your dog and particularly the skin because it helps with inflammation, reduces bacterial growth and supplies the body with a large amount of skin-friendly nutrients. Oats are high in minerals; they contain potassium, phosphorous, calcium, iron, magnesium and B vitamins. They are extremely helpful in maintaining healthy skin and hair and they can also help your dog remove toxins from his body. Most sensitive skin shampoos for dogs are made with oatmeal, but how helpful it is to use them topically is questionable. Liver, especially from grass-fed animals, can enhance your dog’s skin health since it contains extremely high levels of nutrients like zinc, copper, iron, biotin and plenty of other vitamins and minerals. Beef or lamb liver may not be the best choice for dogs with sensitive skin because statistically meat from these animals is more likely to cause skin irritation in dogs (although only muscle meat has been studied; not organs). As another occasional treat, you can include small amounts of cranberries in your dog’s diet as well since they are great for many ailments, including skin problems and eczema in people. They are high in antioxidants, which have anti-inflammatory properties and can also help with your dog’s allergic reactions. While not toxic, some dogs may have problem digesting them, so be particularly careful with the amounts. Sweet potatoes are particularly good for skin since they are rich in vitamin A, C, E and beta-carotene. They also contain iron, calcium, potassium and copper. As a protein source, beef and lamb should be avoided. While lamb has been shown in some studies to be the least likely to cause allergies (although those studies are also flawed), there's some research showing that when it comes to skin problems, lamb is one of the main culprits alongside beef. Use chicken or fish instead. Try to eliminate grains from your dog’s diet because research shows (PDF) some association between grains and skin problems in dogs (Stokes et al. 2011). Wheat, corn and other grains can often trigger food allergies leading to skin irritations. There are many experts who believe that a grain-free diet is the safest bet for dogs with sensitive skin but others that say grain free dog foods have no effect. We still lack conclusive evidence, but for now, avoiding grains may be the way to go. Limit your dog’s intake of carbohydrates in general. Once you drop grains from your pet's diet and prioritize high protein, this will happen anyway. Carbs are not necessary for dogs, even though they can have some positive health benefits. However, they can also flare up your dog’s skin sensitivity, so try to minimize or eliminate things like rice, bread, and even milk. Some carbs, as long as they beneficial for skin, can be left in the diet. Cooking for a dog with sensitive skin is one of the best ways to make sure that he eats only foods that will help to alleviate the symptoms, and it can also be very simple. The key is to make a diet high in appropriate and quality protein and drop anything unnecessary. Here's a good recipe to start with, but you can also find plenty of homemade dog food recipes in Top Dog Tips recipe section. This sensitive skin homemade dog treat recipe is full of vitamins, and you can use any other flour to make these dog treats as long as it doesn't conflict with the ingredients listed above. Preheat your oven to 350° F. Put liver in food processor and add one egg and mix it with the liver. Add half of your flour to this mixture, bit by bit, until you get a wet dough. Place it in a bowl and add the rest of the flour, little by little, until you get a firm dough ball. Use a rolling pin to roll your dough. Start from the center and work your way outwards. The dough should be 1/4 inches thick. Cut the dough into biscuits, grease the baking sheet with coconut oil and put the biscuits on it. Bake for 15-20 minutes and let them cool off before you serve them. You can store these homemade sensitive skin dog biscuits in the fridge for around three weeks and serve them as you please.